For those of the fairer complexion, gradual self tanners are a god send at this time of year. I am no exception, as when I try and tan naturally I resemble your typical Brit on holiday. Red-faced and bacon like. Not a good look. And let’s be honest, the sun in large doses is never good for your skin unless you fancy looking like a wrinkly old boot when you hit your fifties. This is precisely the reason why I have tried many self tanners in the quest to find the best of the best at a reasonable price. 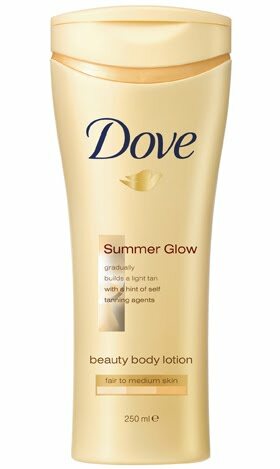 Disregarding the more expensive stuff, which I shall write about later, so far I have found that Dove’s Summer Glow is a pretty good buy if you lean towards the paler side of skin tone spectrum. It comes in two shades – the fair/medium and medium/dark. Having had a slew of tanning disasters, I decided to try the fairer shade to guard against any inevitable mishaps. (You must ALWAYS exfoliate thoroughly first. I cannot stress this enough. If you don’t, you risk looking like streaky uncooked bacon.) Once you have successfully applied a good even base coat, you can usually skip the exfoliation each time you re-apply it – unless you leave it a week and want to start from scratch again. The smell of the cream itself isn’t too bad considering the harsh biscuit tin aroma of most false tans and it’s pretty easy to apply evenly all over your body. It’s also packed full of Dove moisturiser which can only mean silky soft skin! You should wait around fifteen minutes until the lotion is absorbed before dressing, but overall it gave me a pleasing result. This product is great for anyone wanting a subtle sandy glow without going the full nine yards of committing to an all over fake tan. Just remember to wash your hands afterwards! !